On Saturday, March 30, six young birders joined MYBC in the search for returning American Woodcocks. We headed to the Kennebunkport Conservation Trust at dusk. As we were getting our gear out of the cars an American Woodcock buzzed over us just above our heads. We could the distinctive nasal “peent” coming from multiple woodcocks nearby. We were very fortunate to have Bud Danis, who heads the KCT Trail Steward Program, join us for the walk and guide us to a prime viewing spot. Within minutes, we heard one take off nearby. The field at Kennebunkport Conservation Trust is situated ideally facing the western sky. This is great for watching woodcocks in flights as the light of the setting sun gives perfect backlighting to watch their elaborate sky dance. We were able to watch the first few flights in their entirety from takeoff through ascent to landing. We strained our eyes to keep up with the long circular ascent of the woodcock and listened for the twittering high above our heads as the woodcock reached its apex and descended. While he danced high above, we took this chance to approach his display turf by quickly jogging our way closer. Standing still just behind a cluster of apple trees, we held our breaths in the hope that he would land back on his favorite patch of field again. The woodcock did not disappoint. He descended, loudly chirping, and landed about 20 feet in front of us! We spotlighted him, and everyone got great looks through the scope and binoculars at the plump, peenting bird. A few even managed to get photos of the well camouflaged bird. We were very fortunate that he landed close enough that we could hear the little hiccup woodcocks make just after he peented. 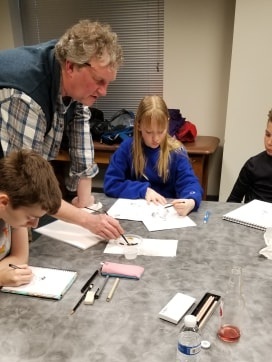 Prior to our woodcock outing, we enjoyed a pizza dinner and a wonderful sketching workshop taught by Michael Boardman of Coyote Graphics. Michael started the workshop with a quick demonstration of how to capture gesture and field marks when sketching a bird quickly in the wild. Luckily, our models were staying put. Michael brought in three bird mounts for us to practice sketching—a Bufflehead, a Black-bellied Plover and of course our target bird the American Woodcock. Michael also gave a brief demo on watercolor and how to mix three basic colors to get almost any color you need to paint wildlife. We had a lot of fun and discovered many of the group had artistic abilities! Perhaps the highlight of the evening came at the very end as we were walking to meet everyone’s parents. Ian thought he heard the twittering of a woodcock in flight and called for everyone to stop. Sure enough, a lone American Woodcock had landed 10 feet in front of us at the base of a large tree on the UNE Campus. Nice spotting, Ian! We will post details about the April outing shortly. Stay tuned. Until then, happy birding!